Pay $50, Get $15 Bonus + 1 Jump Pas..
Pay $100, Get $35 Bonus + 2 Jump Pa..
Pay $50 and Get $65 Gift Card Value + a 1 Hour Jump Pass! Pay $100 to Get $135 Gift Card Value + 2 (TWO) 1 Hour Jump Passes! 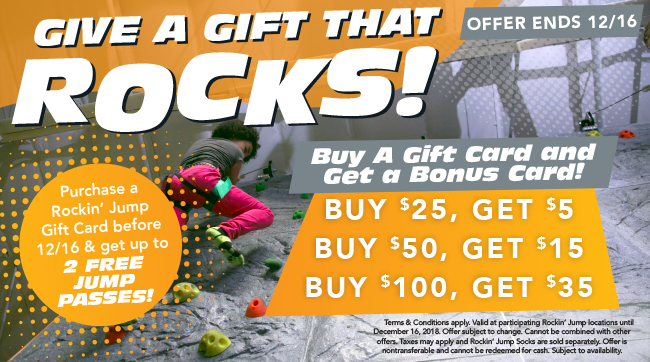 PURCHASE NOW and Receive up to 2 (TWO) 1-Hour free jump Certificates! 'Tis the season for giving, so when you buy a $25, $50 or $100 gift voucher we'll give you extra bonus value as a way of saying thank you and Happy (Jumping) Holidays. At Rockin' Jump, the main floor of the facility is covered with wall-to-wall trampolines, but they aren't only for fun... Visitors of all ages are encouraged to bounce as a means of exercise, too. Beyond just proving Newton wrong, jumpers can enjoy anti-gravity activities such as cannonballing into the stunt-bag area, jousting with competitors on the gladiator-style X-Beam, or pulling down rebounds off the Rockin' Dunk backboard. Stuntbag, dodgeball, and basketball are also available, and the facility hosts a teen night on Fridays and a family night on Saturdays. For those who prefer to earn extra elevation through hard work, the Rock Tower features a 3-story, climbing wall, a much more rewarding way to reach new heights than simply hitchhiking onto a hot-air balloon. The gift card cannot be combined with any other offer, promotion or coupon. Rockin' Jump OFallon is solely responsible to purchasers for the care and quality of the advertised goods and services. Valid at OFallon location only.